Switch from hand-mixing and see the benefits and cost savings! 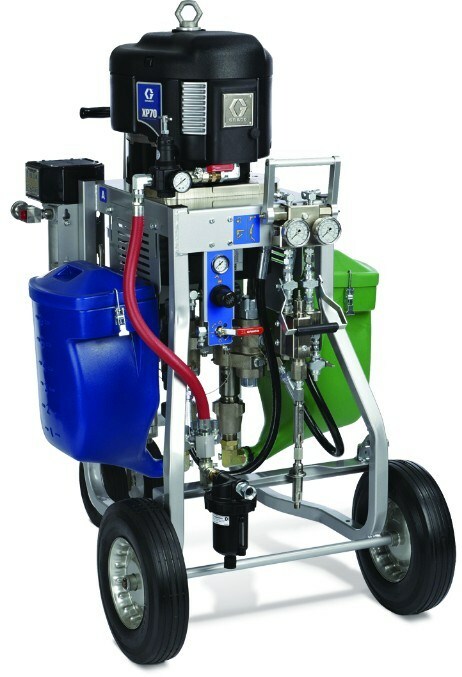 The Graco XP70 Plural-Component Sprayer is designed to pump, mix and spray high-viscosity, high-solids coatings such as Jotun Penguard HSP or Sherwin Williams C400 Epoxy. In addition, the XP70’s design allows you to gravity feed, which can eliminate the need for feed pumps, saving you money. When you upgrade from hand mixing, you'll find that the XP70 provides excellent return on investment, by reducing material waste and by using less clean-up solvent. Contact us to see how this machine can save you money and increase your efficiency. For more information on this machine or any other spray equipment enquiries, email bradley.gibbs@elmbridgesuppliesuk.com or call us on 01452 525757.